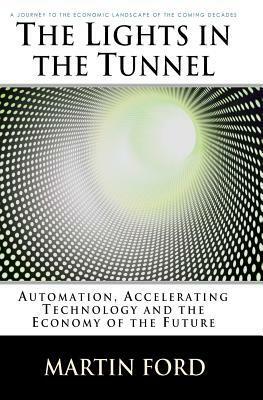 The Lights in the Tunnel: Automation, Accelerating Technology and the Economy of the Future. Martin Ford, 2009. Available in print or as an e-book. A strong argument can be made that a very large percentage of jobs are, on some level, essentially routine and repetitive in nature. In other words, the job can be broken down into a discrete set of tasks that tend to get repeated on a regular basis and can be predicated based on historical data. It seems likely that, as both computer hardware and software continue to progress, a large fraction of these job types are ultimately going to be susceptible to robotic or software automation, and in particular to machine learning technology. Recent innovations like IBM’s Watson computer suggest that machine learning algorithms may soon be able to take on a number of cognitive tasks. As technology accelerates, I think there is little doubt that these systems will begin to match or exceed the capability of human workers in many routine job categories — and this includes a lot of workers with college degrees or other significant training. As robots and smart algorithms increasingly take on the more routine, predictable jobs, this will leave much of our workforce with an unprecedented challenge. Historically, most workers have been able to move from routine occupations in one area to similarly routine jobs in a new emerging area, perhaps acquiring some new skills as part of the transition. However, as technology impacts virtually all routine work across the board, workers will have to find work in areas that are genuinely non-routine or creative in order to remain relevant. There are good reasons to be concerned that a significant fraction of our workforce will have great difficulty with such a transition: after all, if we assume a normal distribution or capability, then by definition, 50% of workers are average or below average. In order to solve the distributional problems that will be created by automation — and to ensure continued, broad-based prosperity — we will need to reform our economic systems. None of this is intended to argue against continuing progress in areas like robotics, big data and AI. However, as these technologies continue to accelerate, the impact on employment and income inequality is likely to become more and more visible to the general public. Ultimately, I think that in order to solve the distributional problems that will be created by automation — and to ensure continued, broad-based prosperity — we will need to reform our economic systems. If we fail to do this, it seems very likely that a public backlash against automation technologies, as well as significant social and economic upheaval could well result.